On a bright winter afternoon an Air National Guard KC-135 Stratotanker lifts off from Pease International Airport in Portsmouth, New Hampshire. The 161 ton (146,000 kilograms, fully loaded) aircraft seems to defy gravity as it takes to the clear blue skies over the Piscataqua River and Great Bay. But this impressive flying gas station shares the air with an even more awe-inspiring flying colossus of the natural world: the bald eagle. Weighing in at about 12 pounds (5.4 kilograms) and with a wing span of seven feet (2.1 meters), the bald eagle is a majestic predator that lives around water bodies with abundant fish to hunt and large trees or cliffs along the shoreline for roosting and nesting. Bald eagle nests are impressive structures built with branches collected by a single breeding pair that maintains the nest year after year. During the winter, bald eagles leave their nesting territories and congregate around open water with readily-available food sources. In New Hampshire, this is along major rivers and estuaries. The states largest estuary, Great Bay, is the winter home for many eagles that summered throughout the Piscataqua River watershed in southeastern New Hampshire. During the statewide 2007 Christmas Bird Count, coordinated annually by New Hampshire Audubon, excited birdwatchers on the Seacoast Team counted 15 eagles in the coastal region, which smashed the old record of six. One of the reasons eagles congregate around Great Bay is the availability of prime roosting habitat at the Great Bay National Wildlife Refuge. 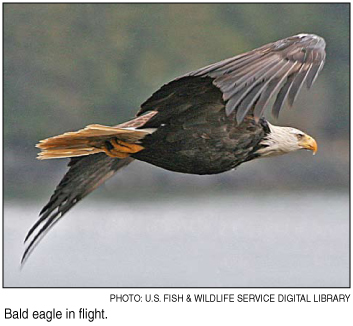 Six miles (9.6 kilometers) of rugged intertidal shoreline includes large white pine trees and other natural features that allow the eagles to roost in peace. Most importantly, development is limited. In addition to the federally-protected habitat of the refuge, the area enjoys large tracts of development-free shoreland, thanks to the protection efforts of the Great Bay Resource Protection Partnership and management by the Great Bay National Estuarine Research Reserve. However, other eagle habitat in the state is not as secure. By the 1970s, historic bald eagle populations in the lower 48 states plummeted to the brink of extinction as a result of loss of habitat, shooting and the pesticide DDT, which severely disrupted the eagles reproduction. After DDT was banned in the United States and eagles received endangered status under the federal Endangered Species Act (ESA) in 1978, eagles began to make a comeback. They were reclassified under the ESA from endangered to threatened in 1995, and in June 2007, were removed entirely from the list. The species remains on the state of New Hampshires list of threatened and endangered species, but as populations increase, they may be delisted in New Hampshire as well. In southern New Hampshire, development has dramatically diminished winter eagle habitat along the Connecticut and Merrimack Rivers. In addition to historic mill buildings, new structures built in the areas adjacent to rivers, also called riparian areas, remove roosting trees and disturb the birds, forcing them to expend valuable energy to fly to quieter places, potentially away from vital food sources. Resource managers must be able to recognize critical riparian habitats and work with landowners to protect these areas from future development. In addition to benefiting wildlife, undisturbed, well-vegetated riparian areas protect water quality and reduce impacts of flooding. Resource managers face a challenging task because of a lack of information about how wildlife uses riparian habitats along long stretches of a river. To address this need for information, New Hampshire Audubon has embarked on a three-year project in 2008 to determine habitat use of wintering eagles along the Merrimack River corridor. Senior biologist Chris Martin of New Hampshire Audubon is leading this project that is funded by a $50,000 grant from the Merrimack River Bald Eagle Habitat Fund administered by theNational Fish and Wildlife Foundation. New Hampshire Audubon plans to announce when the eagles have been successfully tagged and how the public can follow the movements of project birds on the Internet. Until then, eagle watchers can likely get a glimpse of the colossal predator at the Great Bay Discovery Center on Depot Road in Greenland, New Hampshire, or Adams Point in Durham, New Hampshire. Dave Kellam is project coordinator for the New Hampshire Estuaries Project.